6.54pm: Zaveri Bazaar Bomb Blast - Police said the explosive may have been kept between two vehicles, an Activa and a Hero Honda, with registration numbers MH-01 AU 4670 and MH-43 9384. The blast took placeoutside Lala Fast Food on 3rd Agiary Lane, around 50 metres from Mumbadevi temple and around 150 metres from Jama Masjid. The lane, popularly called Khau Galli, is frequented by mostly Gujarati cloth merchants and traders.The blasts, that went off within minutes of each other, injured 15. 6.55pm: Opera House, Near Panchratna Bomb Blast- Here too, the explosion occurred in the Khau Galli bordering the diamond hub. The place with its narrow, crowded lanes is frequented by diamond merchants, brokers and angadias (couriers), most of them Gujaratis and Palanpuri Jains. 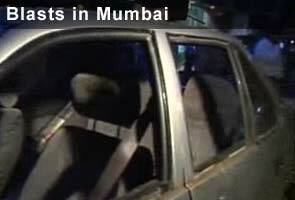 The impact shattered windscreens of many cars and two-wheelers. Police suspect the high-intensity explosive (possibly RDX) was kept on a bike. 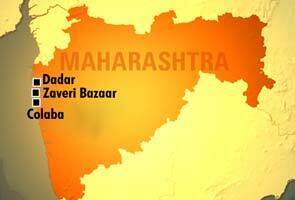 7.06pm: Kabutarkhana, Dadar Bomb Blast - The place is a Maharashtrian stronghold and is crowded during peak hours. The blast occurred at a bus-stop near Antonio D’Silva School, 100 metres from the multi-faith island temple. An Esteem car driver and three persons on two bikes who were close to the blast site were among the injured. The bus-stop was damaged, glass panes of two shops opposite it were smashed. Social networking sites were abuzz with rumours that the Lashkar-e-Taiba may have orchestrated the blasts as it was its 26/11 gunman Ajmal Kasab’s 24th “birthday”. The police, however, rubbished the claims. 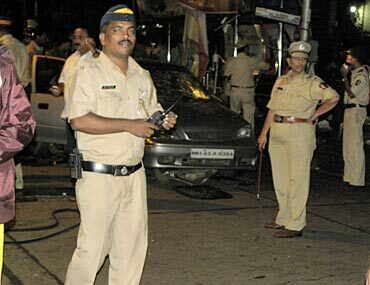 Kasab has been jailed at Mumbai’s Arthur Road jail for over two and a half years. He is under surveillance of CCTV cameras and at least 50 commandos. 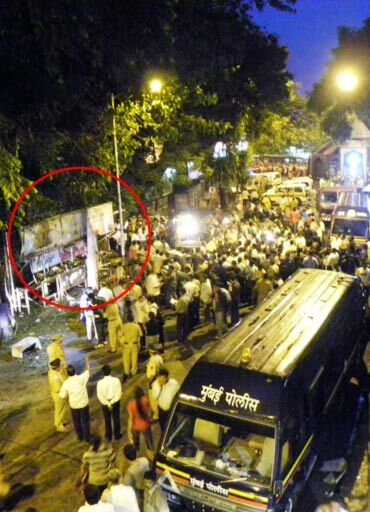 The bus stop where the blasts took place is on the left. A device was reportedly left in the electric meter box close to it. 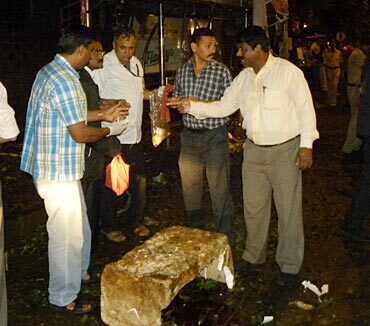 Police officials investigating the Mumbai bomb blast site. @Mahi The people who do this should receive something much more than hatred ! Probably a no trial death sentence !